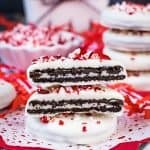 Need a quick and easy gift to share with your friends or family? 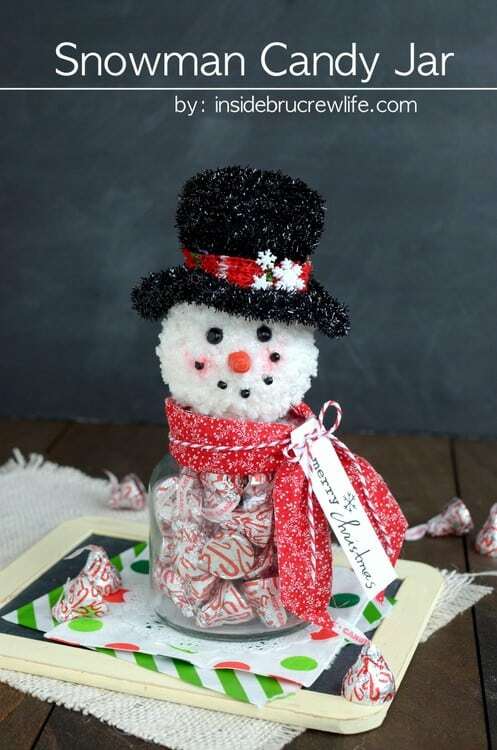 This Snowman Candy Jar is a cute way to share all that holiday candy that you bought too much of with others. Can I just tell you how much I love snowmen? Oh, not the cold wet ones that are outside. I like the fluffy pretty ones that are all over my house at this time of year. I do like the outside snowmen too…as long as I am looking at them from inside my window. A few weeks ago I was at Hobby Lobby buying…well, to be honest I don’t remember what I was buying. Anyway, I wandered down the ornament aisle and found this cute snowman head ornament. He had to come home with me right away. Each year I buy a new snowman for my…I mean our 🙂 tree in our living room. Ok, fine you got me. It’s not really our tree. It’s my tree. I have completely and totally taken over the tree with my snowmen, flowers, and fun colorful spikes. Anyway…so I bought a new ornament for the tree, but then I just couldn’t hang it on the tree. I felt like he needed something more. So, I rummaged through my craft supplies and came up with an empty jar. 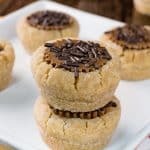 This little guy is sitting on my counter just waiting to be gifted to someone…or maybe I’ll just keep him and eat one kiss every day until they are gone. Let’s make a candy jar together. Step 1. Gather your supplies. 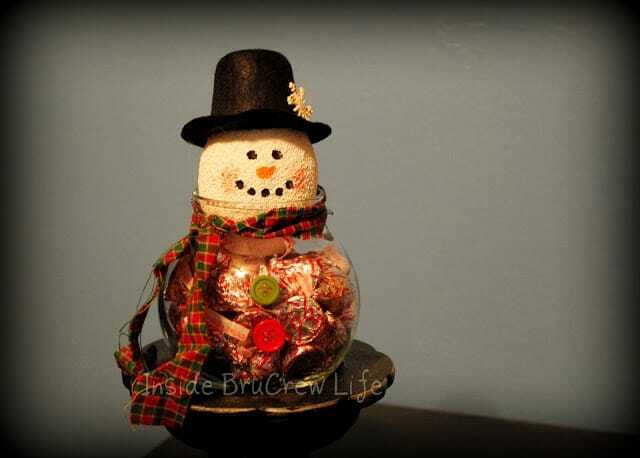 For this you will need 1 snowman head ornament, 1 glass jar, hot glue gun, hot glue sticks, fabric, twine, tag, and Hershey Kisses. Step 2. Remove all tags and strings from the snowman ornament. 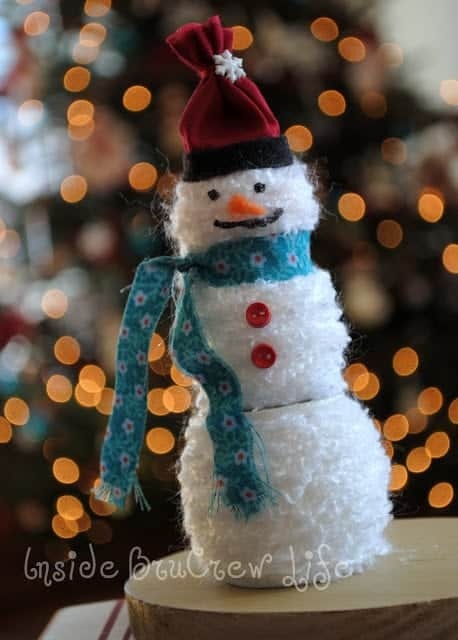 Use the glue gun to glue the snowman head to the top of the jar lid. Let dry. Step 3. Fill the jar with Hershey Kisses. Go ahead and sample a few. Step 4. Place the lid on the top of the jar. Cut a piece of fabric for a scarf and tie it around the jar lid. Add a piece of twine and Christmas tag around the scarf. Step 5. Give the cute candy jar away. 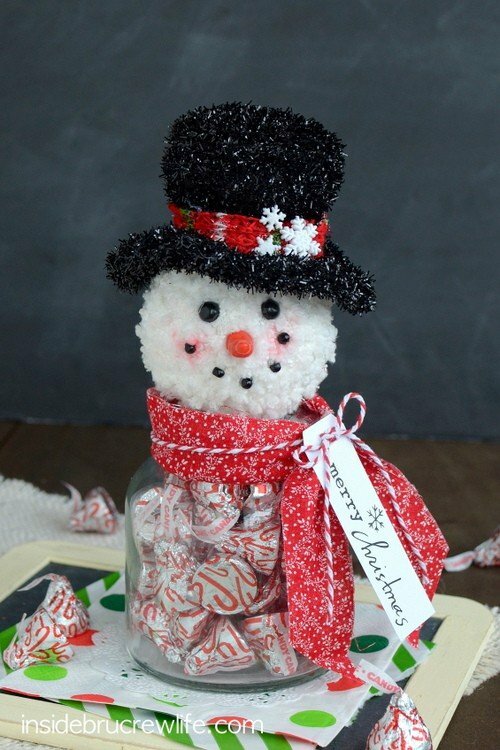 I am jumping on the gifts in a jar bandwagon this Christmas and this one is just adorable! I really like how simple it is, yet it looks cute and festive. Oh man, it is SO cute! Pinned! Thank you Mary Frances! I am all about simple and easy! These are super cute!! 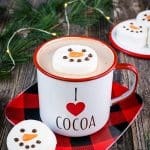 Great way to make homemade gifts! Oh my gosh how cute is this?! And so easy!!! 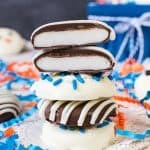 Love this creative and delicious gift idea, Jocelyn! Thanks for sharing! This is so adorable…I love snowmen too…how bout posting some pics of your tree…would love to see it!